You business travelers, speakers, and consultants, are all too familiar with that handy little plastic tool the car rental companies use to evaluate damage done to their vehicle. At one time or another, the Damage Evaluator tool has probably been your best friend or the worst part of your business trip. 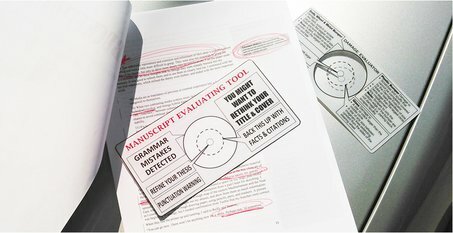 Ever wished you could toss one of these templates onto your book’s manuscript and immediately know a half-dozen critical mistakes about your book? Let’s give it a try! Most cars can pass the ten foot test. It’s when you get up close and really give it a good look that you see the blemishes and mistakes. Only diligence and a commitment to publishing a professional business product will do in the public speakers’ arena. You already know your presentation has to be golden. Likewise, books supporting your platform and brand must be impeccable. Professional covers and interior design are a must. Without looking like a professionally published book, your book might never earn a double take or second consideration. Have you stated your thesis clearly and provided adequate support material to back it up? The clearer you state your position and/or platform, the easier it is to evaluate whether you’ve supported your thesis correctly. Is your position transparent? Crystal clear? Pitted with damage from following another’s position/material/brand too closely? Make sure your position is your own or at very least have other sources properly cited throughout. Are there dents in your support material or content? Are case studies provided, missing, or are more needed? Nothing hurts your book more than faulty construction and missing elements. Likewise, why take ten pages to describe something that an infographic can communicate in a glance? Make efficiency a priority. Typographical errors can be the kiss of death. Almost every traditionally published book will have one or two. (Nobody’s perfect.) But more than a couple errors in your book will definitely damage your credibility. Writing a book to support your speaking, business, or platform isn’t as hard as it once was. Redbrush helps you easily leverage your content, speeches, blogs, and posts into professional books, and in less time than you would imagine. Learn more about turning your ideas, platform, and even blog posts into books with an impact by contacting Redbrush. We offer a complimentary publishing guide through our website at www.Redbrush.com.